Woody Allen is an acquired taste. You either ‘get’ and support what he is doing (just, being a “filmmaker” as opposed to directing movies); or, what he is doing turns you off. Over the course of his celebrated, decades-long career, his cinematic output has proven unmatched. Each year, since the mid-1970s, a new “Woody Allen project” graces the screen. With each passing year, perhaps the distribution becomes less as public interest continues to wane (In fact, the people who don’t get him have long outnumbered those who do!) – but in terms of sheer output and artistic work ethic, Woody Allen deserves already the Lifetime Achievement Award he is certain to receive. However, now, let’s talk about consistency. With such regular output year after year, it’s inevitable that the quality of the work becomes uneven. Elton John suffered this way: for every enduring classic like “Candle in the Wind” or “Circle of Life”, there have been album releases full of unsingables. Our recently departed genius Prince left behind songs which were not “Purple Rain”… and poor Robert DeNiro, in recent film after film, grows further in stature away from the Academy Award-winning ‘raging bull’ of Taxi Driver and Mean Streets. To me, Woody Allen has rarely been unwatchable. But throughout the years, there have been, let’s say, creative misfires. Leaving his beloved New York City for a European change of scenery reinvigorated (for the most part) his latest works, from 2008’s Match Point to Magic in the Moonlight in 2014. However, returning to the U.S. last year with Irrational Man, it seems the filmmaker again lost his Mojo. Drawing, as he has before, on the themes of such artists as Dostoevsky and Ingmar Bergman, there was little humor to be found in Irrational Man to help counterbalance (SPOILER ALERT!) a cyanide poisoning, moral angst and a second death, down an elevator shaft. “Dark” would be my one-word review of that film! 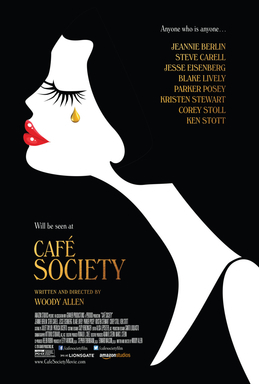 Still, I’m looking forward to the 2016 Woody Allen project, Café Society, which will have its world premiere in two weeks at the 69th Cannes International Film Festival – and will hopefully, be a return to form for the filmmaker. So how about you? Do you 'get' Woody Allen? Do you have a favorite Woody Allen 'project'? Contact Vivienne and let us know, or post below!